"Met with barely a mention from the world press, a stony silence from Nicaraguan President Daniel Ortega and scorn from local government, the indigenous Council of Elders annulled all land contracts with the Nicaraguan government pending renegotiation, cancelled government elections, called for businesses to begin paying tax to them instead of the government authorities and gave the police and military six months to organise an orderly and peaceful withdrawal. Not only have the new ‘government’ already begun work on a currency, a flag and a national anthem they are also backed by the ‘Indigenous Army of Moskitia’, comprised of up to four hundred conflict veterans." “There is tremendous unrest; the communities are awakening little by little and now it will not be possible to stop them. What they want is liberty; they want independence." 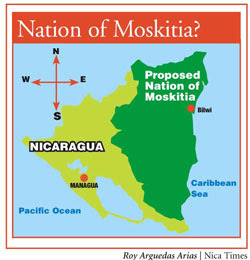 Promised autonomy by the national government in 1987, the Mískito coalition has finally decided that the unfulfilled pledge will likely never be honored, and have thus moved to an outright declaration of independence and statehood. This move comes on the heals of a similar declaration by the Lakota in the U.S., the election of an indigenous president in Bolivia, and the very active Zapatista movement and "the Other Campaign" in Mexico. It appears as if the Americas are finally seeing the reassertion of indigenous peoples after what could arguably described as over 500 years of oppression. See the links below for various articles on the Mískito declaration, and check back with us for updates as we find them. "...the communities are awakening little by little and now it will not be possible to stop them. What they want is liberty; they want independence." I wonder if the Lakota could/would undertake similar action in the U.S.? Unfortunately, those 400 members of the new Miskito army seem the key. Good question about the Lakota - we haven't seen or heard anything since they officially withdrew from U.S. treaties. It would be interesting to see the U.S. reaction to a Lakota army in this supposed new age of the Obama administration. Where can something like this lead? There is no history of this working anywhere else in Latin America. Hopefully it doesn't lead to suppression and outright oppression.